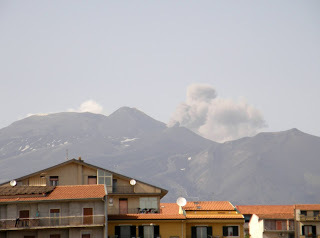 Luckily, this is taking place on the opposite side of Etna from where I live! Europe's most active volcano, Mount Etna, continues to spew lava for a fifth day since erupting on Saturday. 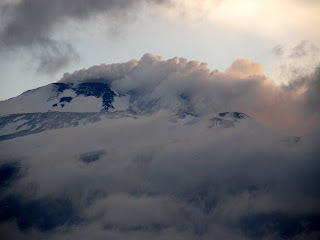 All the earthquakes tremors from the past several weeks really were a prelude to some volcanic activity on Etna again. These photos were taken this week. (How many photos do I have of Etna? Hundreds! And I keep taking more!) Above is a morning view of the top I took on the way to school on Wednesday morning. It had rained and turned cold, producing a lot of snow. But notice the dark gray cloud on the left? That's ash. 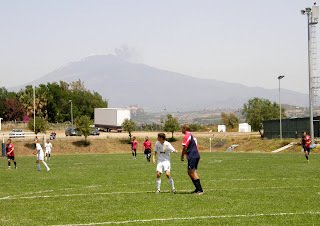 Imagine playing your high school soccer game in the shadow of an erupting volcano! Here are the Sigonella boys vs. Aviano this afternoon. See the cloud of ash at the top? That kept happening all day long. Here's another puff of ash that I captured on my way home this afternoon, from the nearby town of Belpasso. There is a strong lava flow, which is clearly visible at night, but it's on the sea side of the volcano and not seen from my side (this side, the south side). Our Italian-American friend Rose took us to the nearby town of Trecastagni to see a whole parade of painted Sicilian carts this weekend. 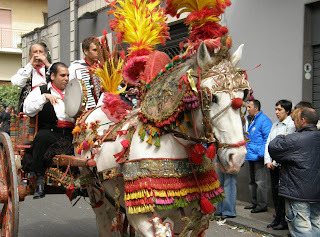 I had seen single carts occasionally and randomly before, but this was a real parade with about 15-20 of the beautifully painted carts complete with decorated horses and musicians playing old Sicilian folk music with flutes, accordians, and tambourines all the way. We were caught a little unaware as we stopped in a bar for a cappucino and suddenly saw a cart pass by the window. "Who ever heard of something starting on time in Sicily?" said Rose. So we rushed outside and enjoyed the long and lively parade a couple of times as they circled the town square more than once, went all through town to the main church (where the real action of the festival was happening), and then back through the square again. So basically we saw them three times throughout the morning. The beauty of the carts is in their painting--they are covered with coloful folk designs on every square inch with motifs that seem to be primarily medieval (Crusader knights fighting the Arabs) or religious with a few mermaids thrown in for fun. Not content just with painting, they are also carved with gargoyles, mermaids, angels, flowers, and all other kinds of designs. Underneath the carts, it was pointed out to me, hang such things as the cartman might need--an umbrella, a jug of wine, a bucket, etc. 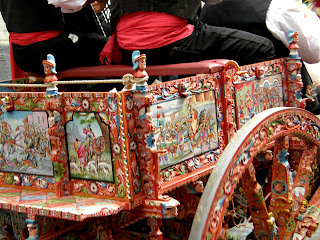 Nowadays, the carts are only used for show, but the government considers them an important part of the Sicilian culture and subsidized their upkeep. There are very few people who still do this kind of painting, and even fewer who build them. No longer used for produce and farming, they have been replaced by the three-wheeled trucks, some of which are painted in the back in the same style. All of this was part of a huge religious festival in Trecastagni honoring the town's three brother martyr-saints, the most famous of whom is Saint Alfio. More on that in another entry. Today's price for gas per gallon in Atlanta, GA, is $3.30 for regular and $3.63 for premium. Everyday I hear or read about Americans complaining about these prices. It has even become a campaign issue. Whatever the reason for the prices, it's unlikely they will come down. They never do. But Americans, count your blessings! Everyone else in the world pays a lot more, especially Europeans, and especially Italians. Even we Americans in Sicily who can buy gas coupons on base are paying $4.16/gallon (that's $111 for 100 liters). It now costs me over $40 to fill up the Mini! But Sicilians are really taking a hit. Sold by the liter, today's stations were showing 1.459 euros per liter, which, coupled with the lousy dollar rate, translates to $8.81/gallon! Who can even afford to drive? Even a little Fiat 500? And they have no regular or super here, just one type of unleaded. The moral of the story--things could always be worse. Let's just hope they don't GET that way. Three aftershocks, the last one recorded in the afternoon at Nicolosi, on the northern side of the volcano: no consequence. Mild earthquake also between Lipari and Salina. CATANIA - A swarm of seismic forty shock was registered last night on Etna by seismographs of the national geophysics and volcanology. The two aftershocks of the earthquake most significant respectively of magnitude 2.9 and 3.3 on the Richter scale, were located on the northern side of the volcano. Both seismic events, which have not been felt by the population, have originated about one kilometer deep in an area five kilometers north east of localities' Pizzi of Blacks'. In the afternoon, around 18.30, was reported a shock third and fourth Etna in Sicily: second instruments of national geophysics and volcanology, the shock of magnitude 1.7, was recorded in the town of Nicolosi, in the province of Catania. The quake was slightly felt by the population. From the checks carried out by the situation room Italy Department of Civil Defence not damage to persons or property. A seismic shock was registered in Messinese at 3.26, with a magnitude of 2.4. The area affected by seismic phenomenon, according to a press release refers the Department of Civil Protection, is the sea near the islands of Lipari and Salina. From the checks carried out by the situation room Italy department are not, at present, damage to persons and property.